The Long Tail is a book by Chris Anderson. I love it because it made sense of how I have experienced marketing since the “web marketing age” began in the mid-90s. 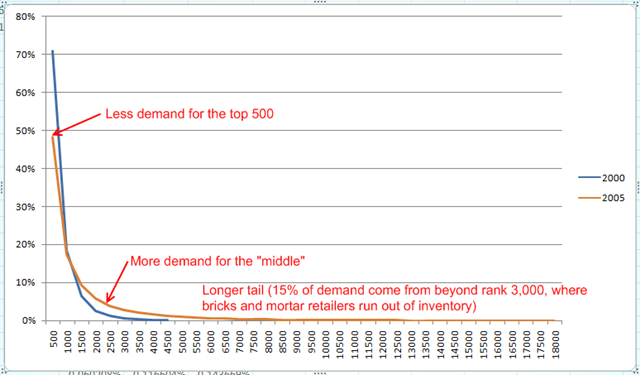 The implications of the long tail of the demand curve could change everything about how you view marketing (impacting messaging, revenue generation, and promotion) for your ministry. Long Tail theory says that new technologies have made visible and accessible all the small market segments that exist within your general market. If you are a neighborhood church, exploring your long tail will mean communicating to and ultimately serving many more people who live around you. If you are a large independent ministry, this means that it’s now possible to distinguish and address the needs of many small, “micro markets” within your space. And, whoever you are, you can do this identifying and accessing, and addressing at a cost you can afford. Wow, that was a mouthful. Let’s start over. Most of the members of any market or audience can be reached through conventional (translate “expensive”) marketing tools like print/broadcast advertising and trade shows (two of the fastest ways ever invented to squander a stretched and stressed marketing budget). Enter the Web and a whole new arsenal of marketing tools that now make it economic to find and serve all he micro markets or niche markets that will also want what you’re offering. Email, web ads, social media, e-pubs…all these and more are now available to help access new parts of old markets at a price you can probably afford. Like many of the posts here on Ministry and Marketing, this one is designed to create a desire for more information. Search “long tail book,” “web marketing,” and “niche marketing” to dig deeper. Or, just ask us.